Market reopen with a big selldown, what is happening? Are we in a bear market now? Will there be a Short term rebound soon ? Yes, in a longer time frame, we can be in a bear market already as STI has dropped more than 25% from the high in 2015. However in a shorter timeframe, we see that STI has stopped making new low after hitting 2530, seems like this is the support level that Shortist covering shorts and bargain hunter start picking up stocks. 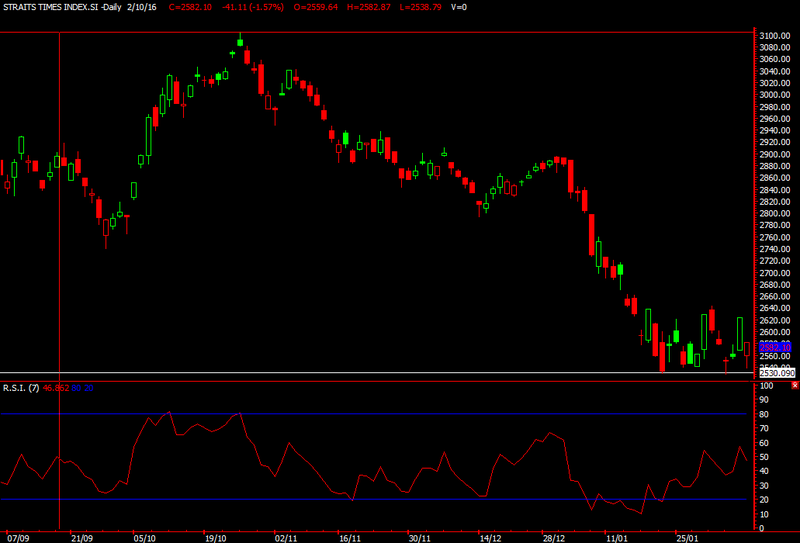 As long as STI can stay above 2500, i think there is a good chance for the Short term rebound to come. With the volatile market where can investor part their money now? Since the beginning of this year, investment dont seems to be as easy as before. For those investors who are already holding stock in hand, if the stock is dropping with the market, i would suggest them to keep cash is better. For those who are holding cash and intend to invest, I would suggest them to look at those strong stock that is going up even when market is going down. For example, today we see that the singapore stock like SMRT, Gold ETF, and also the 3 Jardine companies. These are the stocks that should be our watch list now.